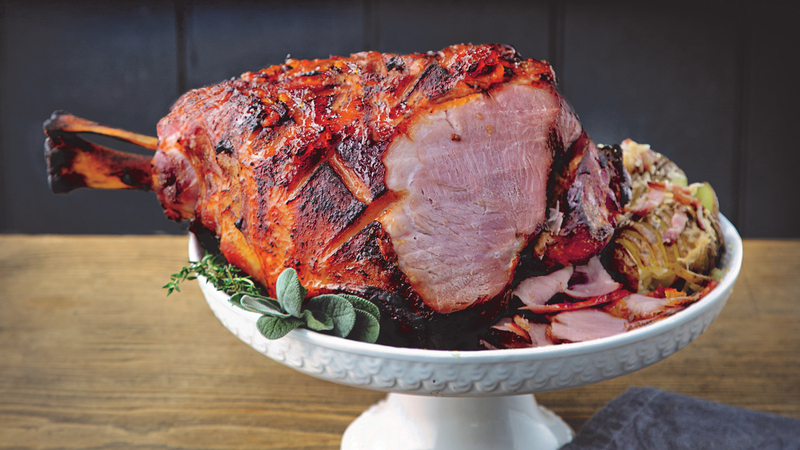 Kevin's Orange Marmalade and Sriracha Glazed Ham gives a new twist to a Christmas classic. 1. Place the ham in a large saucepan and cover with water. Bring to the boil, then reduce the heat and simmer for 2 hours. Once cooked, remove from the pan. When it’s cool enough to handle, use a sharp knife to carefully remove the skin from the ham, then score the fat in a criss-cross diamond pattern. 3. Combine the remaining ingredients in a small bowl to make the glaze. Brush the surface of the scored ham with the glaze, then bake in the oven for 15 to 20 minutes, until golden brown. 4. Remove from the oven and allow to rest for 20 minutes, loosely covered in a foil tent, before carving. Serve warm.